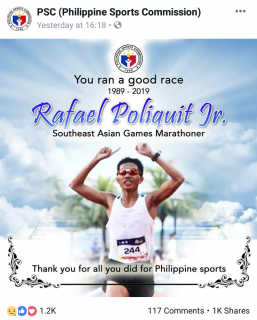 (Eagle News) — Filipino marathoner Rafael Poliquit Jr. has passed away. The Philippine Sports Commission made the announcement in a Facebook post on Thursday, April 11. “Thank you for all you did for Philippine sports,” the PSC said. Poliquit, who won the Milo Marathon three times, was supposed to represent the country in the 2019 Southeast Asian Games. He was also among those who represented the country in the 2016 Boston marathon.